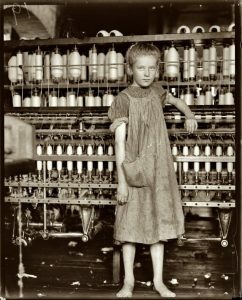 A few weeks ago we featured an article, Down-in-the-Mines at 9, by Ned Campbell, about young boys working in the coal mines; this article, also by Ned Campbell, is about the Bobbin Girls, the young girls who worked long hours in the textile factories. In the early 1900’s America was industrializing rapidly and one industry that was very profitable was textiles. Textiles are the fabric that will make clothing. Weaving the threads of cotton or wool together in large steam powered machines would produce the fabric. Women worked the mills and young girls, often their own daughters, worked at keeping the machines well supplied with bobbins of thread. 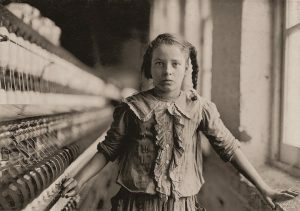 The above picture is of one of the spinners in a Cotton Mill. She has been in the mill one year. Sometimes she works at night, and makes 48 cents a day. Out of 50 employees, there were ten Bobbin Girls about her size. Before child labor laws were enforced in this country, the Bobbin Girls worked long days, in unhealthy conditions, in the textile mills.